Now that summer's here, is your family's sports equipment overwhelming your garage? You don't want to wade through piles of baseball equipment, roller blades and pool toys to reach your golf clubs at the bottom of the pile. You also don't want to trip over sidewalk chalk, swim goggles and soccer cleats as you try to enter your home. Corral your family's summer sports equipment in the garage with four organizing tips. 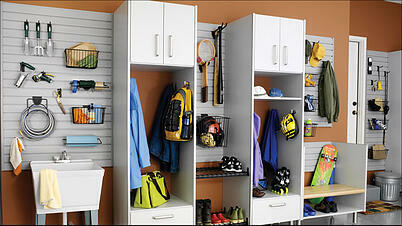 Find everything you need with a single glance when you hang sports equipment on the wall. Pegboards and hooks are easy to install on a wall of any size. They help you sort your tennis rackets, basketballs and roller blades out of the walk way. They're also super easy to install and use, which ensures you have energy to train your kids to return their equipment to the hooks. See-through bins sort items on your garage shelves. They also feature lids that make the bins easy to stack in the corner when winter weather strikes. For best results, organize your bins in a way that fits your family. You may want to buy one large bin for each different sport your family enjoys or give each family member a bin for their personal jump rope, bubble wands and soccer cleats. Either way, remember to label your clear bins to help everyone participate in keeping your garage tidy. When placed near the door or along a wall, a storage bench holds shoes and baskets. Assign each family member a color-coordinated basket or use the bench to hold the equipment you use the most. As a bonus, the bench gives your family a place to sit down and change shoes after a hike or basketball practice. No matter which type of organizational storage you use, stock a basket of cleaning supplies nearby. The soft brush and cloth, sanitizing wipes and powder allow you to clean your sports equipment as soon as you're finished using it. You no longer have a pile of cleats, goggles or clubs cluttering up your garage. Instead, all your equipment sits in its assigned spot where it awaits your next fun-filled day. Are you ready to get your garage in tip-top shape? Contact Boston Garage for assistance in installing organizational aids. We look forward to helping you prepare for a day of family fun on the golf course, basketball court or hiking trail.